During Dad and my trip home in June 2005, we found out that we have Australian relatives! A day after I left to go back to the mainland, the family was having a Chinese dinner in Aina Haina to celebrate Grandpa and Grandmas 62nd anniversary, and they ran into Yvonne (center), who introduced us to Leanne Jan (kneeling between Grandpa and Grandma) and her husband Jody Wong (no relation to Jeff & Yvonne Wong). Leanne is Muriels (see picture below) niece, was born and raised in Sydney, and thus has an Australian accent that everyone found most delightful and surprising coming from one of our own relatives. Leanne is expecting so we were excited to learn that in a few months we should have yet another new Australian relative. Mary, Muriel (Sonnys wife), Sister, Uncle George (Grandmas brother), Kristie (Jamess wife  Sisters son James took these two pictures with his digital camera and so isnt in the pictures), Bill Lee (Sisters husband), Sonny (Sisters brother). Grandpa and Grandma with Bill & Sister and Mary, who was named after Aunty Mary Pearson, Grandmas sister and Sisters and Sonnys mother (confused yet?). Jon Lees (Bill & Sisters son) family in Los Angeles: his three dogs. 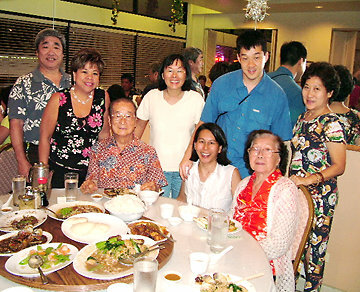 The Lees and Sakamotos at the family Chinese New Year luncheon 2002. Jon and Aunty Mary came up to the Bay Area to see Dads photo exhibition at the Blackhawk Museum (February 20  May 19, 2002). We had lunch at Jade Villa in Oaklands Chinatown and looked around Rattos, an Italian delicatessen. 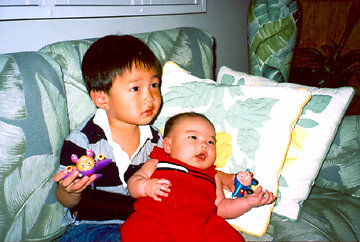 The Lee brothers, Jon and James. Could there be a family resemblance? This was taken December 25, 2002, at Uncle Michaels house after the big holiday dinner. Our youngest cousin is Damon Lee, son of Kristie and James, shown here with older brother Cameron. This is from their Happy New Year card of 2005. This was taken on Camerons second Christmas, December 25, 2002. Camerons first Christmas, 2001, with grandparents Bill and Sister.